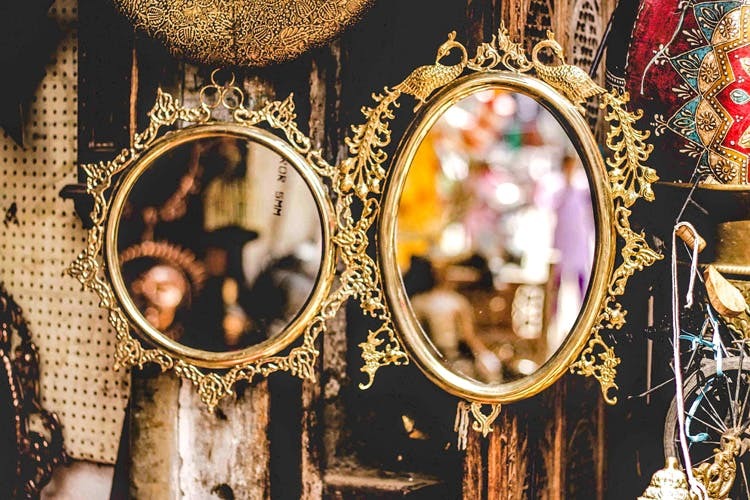 So often my response to the question, ‘Where did you find that?’, asked on my blog has been, ‘At Commercial Street, Bangalore!’ Whether you are just browsing for inspiration or looking for a fabulous dress for less, you will find that Commercial Street has lanes of style to tempt you. I totally enjoy the thrill of the hunt, unearthing a priceless necklace or buying a dress for just INR 300 and trust me, it can be one of life’s joys. However, shopping at Commercial Street can also be tricky and, frankly, overwhelming. So I decided to take you guys on a tour with me and demystify this market to those of you who have eluded it until now. I’m sharing the GPS locations of some great shops in this post.This is hard-to-find shopping wisdom, fellow fashionistas. Use it well. In general, the earlier you arrive, the greater the selection. Mornings are good to browse at a slower pace too. The later you go, the better the bargain as the closing time gives you a slight bargaining advantage. Most shops do not accept credit cards so make sure that you have enough cash before you start shopping. Remember to carry change. It’s also smart to set a budget before you hit the market, or set price limits for certain items so you don’t overspend. Try bargaining every time you shop; you may get a great price reduction and enjoy the fun and pleasure of shopping. If you see an item you absolutely must have, go slow with point no 4. Maybe it’s worth that extra 100 bucks. If you are looking for a silver lining in your jewellery box, this is the place. This shop has a great selection of mainly sterling silver pieces like rings, earrings, necklaces and bracelets. Their collection is very ethnic yet contemporary. Every piece that I have ever bought from this shop is still much-loved. The store is very clean, well presented but small, so you need to make special effort to not miss it. Though I feel the prices are a little towards the higher side, but it’s totally worth it for the unique designs that they have. Who wouldn’t want the treasured things this antique store holds. On the main lane of Commercial Street, this store will certainly catch your attention. This little store offers one-of-a-kind vintage brass pieces that you wouldn’t think twice before buying. The old uncle who sells these items may initially look stern but is quite open to bargaining. The ammunition is cash, an experienced eye and some wheeling and dealing. Fashion accessories are among the popular buys here. There are umpteen small shops where you can buy pretty much everything, including earrings, rings, necklaces, belts, sunglasses & even belly rings starting from as low as INR 50. Sometimes you don’t want to pay a high price for jewellery or other accessories. In fact, sometimes we don’t want to pay more than even 200 bucks because we know that it won’t last for long. So this is your place for guilt-free indulgence. Where: Trust me you will find them yourself. There couldn’t be a cheaper way to bulk buy outfits. Every piece of clothing here is priced between INR 300-450. This store stocks a lot of tops, skirts, and dresses which are either brand rejects or export surplus. The mantra to shop here is to have patience, you need to spend crazy amounts of time going through each item in order to find your steal. What’s even cooler is the fact that if what you like does not fit you well, there is a tailor inside the shop to alter it for you in 10 mins. Isn’t that cool? Now that you know about these places, what are you waiting for? Get out there and explore this wonderful street. I’ve not even mentioned the yummy street food including Bhel Puri, Lassi and Cut Mango! Take a day off and unwind in this chaotic home of small and big finds.